T-Mobile led the pack adding 1.125 million postpaid, 73,000 prepaid, 479,000 MVNO and 141,000 M2M customers for a total gain of 1.8 million customers vs gains of 2.1 million in Q4 2014 and 2.4 million a year ago in Q1 2014. AT&T added 441,000 postpaid, 945,000 connected device subscribers and 98,000 prepaid connections but lost 266,000 reseller customers for a total gain of 1.25 million subscribers vs gains of 1.9 million in Q4 2014 and 1.1 million in Q1 2014. Sprint added 211,000 postpaid, 546,000 prepaid and 492,000 wholesale customers for a total gain of 1.2 million customers vs gains of 892,000 in Q4 2014 and a loss of 467,000 in Q1 2014. Verizon added 565,000 postpaid but lost 188,000 prepaid customers for a total gain of just 378,000 vs gains of 2.07 million in Q4 2014 and 549,000 in Q1 2014. However only Verizon and AT&T made money last quarter as T-Mobile and Sprint posted relatively small losses. Verizon made a profit of $4.34 billion last quarter compared with a loss of $2.15 billion in Q4 2014 and $5.99 profit billion in Q1 2014. AT&T made $3.2 billion last quarter compared with a loss of $3.98 billion in Q4 2014 and a profit of $3.7 billion in Q1 2014. Sprint lost $224 million compared with losses of $2.4 billion in Q4 2014 and $151 million in Q1 2014. T-Mobile lost $63 million last quarter compared with a profit of $101 million in Q4 2014 a loss of $151 million in Q1 2014. *Estimated. Verizon doesn't report wholesale and M2M customer numbers. Verizon reported 108.6 retail connections at the end of Q1, 2015. Industry analysts estimate that Verizon has approximately 128 million total subscribers, including wholesale and M2M connections. The number of prepaid customers increased for the third quarter in a row. All the carriers except Verizon gained prepaid subscribers. Verizon CFO Francis Shammo seems willing to accept some prepaid losses telling investment analysts, "...we are not satisfied with any losses, but then again, we will not chase every add either based on just cheap price". América Móvil's Tracfone subsidiary, which operates under the Straight Talk, NET10, Tracfone, Simple Mobile, Page Plus, Telcel America and SafeLink Wireless brands, and is by far the largest prepaid MVNO lost 318 thousand subscribers last quarter. That compares with gains of 101,000 subscribers in Q4 2014 and 1.85 million in Q1. TracFone blamed most of the loss on a "clean-up" of unqualified lifeline customers. But lifeline cleanup happens every year and I think it's more likely that much of the loss is due to the tremendous pressure all MVNOs are under because of the steep cuts in the price of mobile data by the big four. Going forward I expect to see prepaid prices continue to drop as the carriers fight to keep posting positive overall gains. Sprint lost 220,000 million in Q1 2014?!? Nope. Just a regular, old 220,000 customers. "Sprint lost $224 million compared with losses of $2.4 billion in Q4 2014 and $151 million in Q1 2013." Dennis meant to type Q1 2014. FierceWireless reports that Sprint had a net loss of 383,000 total subscribers in the year-ago period (2014 Q1). Typos corrected, thanks Nick & Anonymous. I double checked Sprint's Q1 2014 subscriber numbers and they actually lost 467,000 customers (383K Sprint platform plus 84K Nextel platform). I have no idea where I got 220K numbers. Thanks for the heads up. A household that has a person currently getting certain types of government assistance, such as food stamps, is entitled to one cellphone with service, that is subsidized by taxpayers (who pay for program operations) and other cellphone user fees (USF). The government pays money to carriers, who are supposed to verify that the person/household receiving the phone actually qualifies. Tracfone paid a large fine to the government because they were signing up lots of people who did not qualify, and billing the government. One reason why our taxes and USF fees keep going up. 1.2 M new customers for Sprint in 2015 Q1 is their best performance in 3 years. 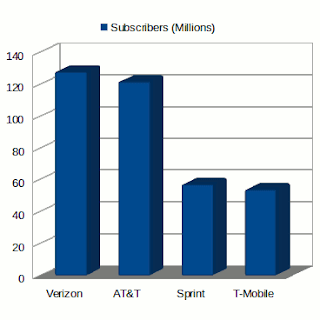 Interesting that the four major carriers claim a total of 364 million subscribers. Last time I checked there were only about 320 million people in the US. Also, wouldn't Tracfone's subscribers be included in the separate prepaid counts for each carrier? PagePlus under Version, Simple Mobile under T-Mo, etc. So the total prepaid subscribers should be about 48 million, not 73 million. Great job collecting all the statistics! Boy, you'd think Tracfone's numbers would have them see the importance of sending sims out in a timely manner. I've been waiting for 3 weeks now with no indication that they even know they're supposed to send me one. Tech help is utterly useless. "sorry for the inconvenience, wait 3-5 more days". If they all had gains, where are these coming from? No churn? No subscriber losses to take from one another? Mostly tablets, connected cars, "Internet of Things"
I think if you go back year after year, you will usually find fewer cell phone users each previous year. It's just growth, that is fairly constant. Penetration of this technology. just like (for one example) when color TVs were introduced and more and more had them each year after. AT&T gained more prepaid customers than T-Mobile? That's new! I guess Cricket must finally be catching on. Yes, AT&T got back about half of their losses from Q1. T-Mobile convinced about 200,000 of their prepaid customers to switch to postpaid in Q1, so they are pleased. Looks like Cricket is cannibalizing AT&T MVNOs, not the competition. Data coverage is the advantage. AT&T can't figure out how to translate it into prepaid growth. Their MVNOs lost 266,000 customers, so they had a net loss of 168,000 customers in prepaid. Most new prepaid customers don't see any big advantage. where I live T coverage far exceeds that of S and TMUS. The smaller two having about equal coverage (smaller footprint than T) but with different gaps. wow it looks like T-Mobile is not doing to well with Metro and their own prepaid plans, only 73,000 gain. I'm not an MBA, or a T-Mobile fan.... but to me, a company gaining tens of thousands of new customers in a quarter, and "not doing well" simply do not go together. 1,800,000 new customers, by far the most of any carrier. Migrated 195,000 branded prepaid customers to postpaid, where they pay more. That sounds like success to me. It is evidence of success, yes, though not proof. Generally a business that as gaining customers is doing well. 73% growth in subscribers over two years doesn't convince you either? What would it take, "generally?" It's darn good evidence, but not proof. Speaking generally (not about T-Mobile specifically). There are other matters such as cash flow, where a company can flounder and die while customers flock to it. because they are losing money on each customer, or for other reasons (debt. etc). Look at all those dot-bombs with millions of online customers that only rarely turn a profit for examples. So yes, having lots of customers in a business sounds good and probably is good, but it is not necessarily proof of success. That is all I meant. Investors think T-Mobile is succeeding. TMUS stock shares, over the last one month and the previous three months, have advanced 6.92% and 17.16%, respectively. From the start of 2015, TMUS gained 28.51%. Their stock is trading above its 50-day and 200-day moving averages. TMUS's 50-day moving average of $32.58 is above its 200-day moving average of $30.00. Investor information like this, exactly. A better indicator of success than subscriber growth. Regardless, the logic of the assertion that gaining 73,000 new customers (made May 6, 2015 at 6:45 AM) means TMO is not doing well is absurd. The reply was about 'not doing well' in Q1 vs success in Q1. You changed the subject to what it takes to prove that a company is successful. Looks like you both agree the original comment was off base. Is Cricket's network the exact same network as AT&T (without roaming)? So should I expect service to be just as good when not roaming? Or are Cricket customers "low priority" on the network and so if it gets busy/congested, Cricket phones would not do as well as AT&T phones? And are there towers that Cricket customers don't have access to but AT&T do? Cricket uses the AT&T network, the same towers, the same backhaul. There are obviously differences in the network routing and prioritization that give Cricket higher latency,and capped speeds. When the network or a portion of it is under stress I suspect that Cricket, GoPhone and MVNOs all get a lower data priority than postpaid. I read that Gophone has slightly less coverage than AT&T. Do Gophone and Cricket have access to the full AT&T native network? Perhaps if Cricket is (like Boost claims of Virgin) also owned by Russell Brand. @Dennis Bournique: Does AT&T reveal how many of its customers are on GoPhone and how many of its customers are on Cricket? AT&T has 10.04 million total prepaid customers. Cricket just announced they have 5 million so GoPhone has the other 5 million. NEWS TIP: A HoFoer has discovered a way to increase AT&T data speed by changing a secret Android setting. Interesting, they had used up their high speed data and LTE and HSPA+ were throttled to to128 Kbps. They switched the phone to 2G and it was actually slightly faster at 155 Kbps. They claimed the difference was enough that streaming audio didn't buffer on 2G but did on throttled LTE. Many phone models on various platforms have the network mode switch in plain sight in the network settings menu, my T-Mobile LG G2 and a couple of ancient Symbian phones do. AT&T likes to hide the setting on their branded phones. Sometimes there's a dialer code to enable it. The dialer codes are device specific. The "secret" code mentioned on Hofo didn't work on a couple of phones I tried it on. PhoneNews.com published a news article today about that HoFoer's discovery.